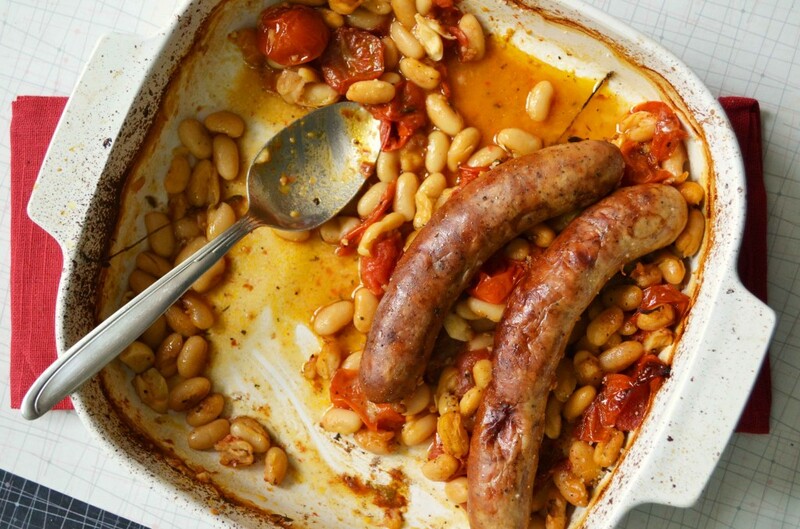 Last week, someone tweeted me a link to Pam Anderson’s Cassoulet-Style Italian Sausages and White Beans from her new book Perfect One-Dish Dinners: All You Need for Easy Get-Togethers over at The Merry Gourmet. It was brilliant, really – and today, as it hovered around ten degrees with grey skies and a constant threat of drizzle, it seemed like the most perfect fall (sorry, it’s true) meal in a dish. It took approximately sixty seconds to assemble, and warmed the house as it roasted over about an hour. I love that – the smell of dinner cooking between school and dinnertime – especially when it’s something that goes really well with a glass of red. And extra-especially when it’s something good for us and exceptionally tasty – the juices all getting together to create a sticky mess of beans and soft tomatoes. This will become a staple around here this fall and winter. Pop it into a 425°F oven for a half hour to an hour – once the tomatoes start to split and release their juices and the sausages turn golden take it out and stir in a rinsed, drained can of white kidney beans (or 2 cups of beans you’ve simmered yourself). My sister came in the door and proclaimed DOES IT EVER SMELL GOOD IN HERE! And it really did. And it tasted good. And it was fast (and yet slow – the best of both worlds, really), cheap, well-received by the masses. Looking forward to leftovers tomorrow. 1Adjust oven rack to lowest position and heat oven to 425°F. 2Scatter the tomatoes over the bottom of a baking dish. 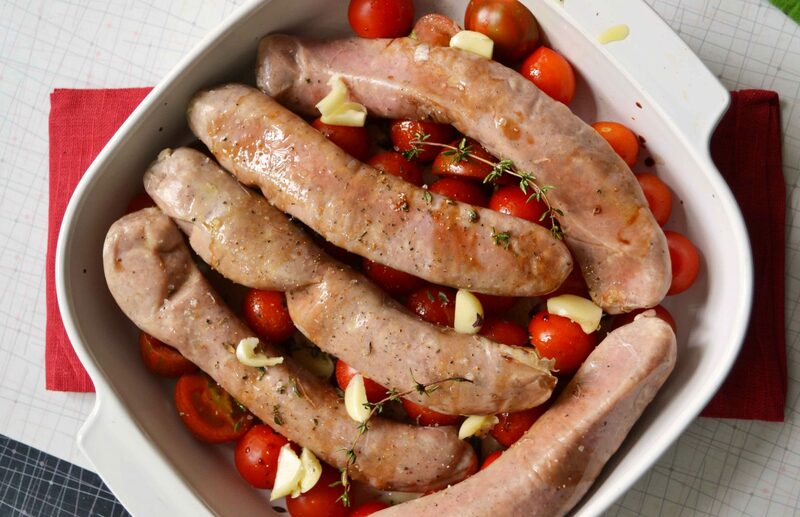 Add the garlic, lay the sausages overtop, and drizzle it all with some balsamic vinegar and olive oil. Toss in a few sprigs of thyme and/or rosemary, and sprinkle with salt and pepper. 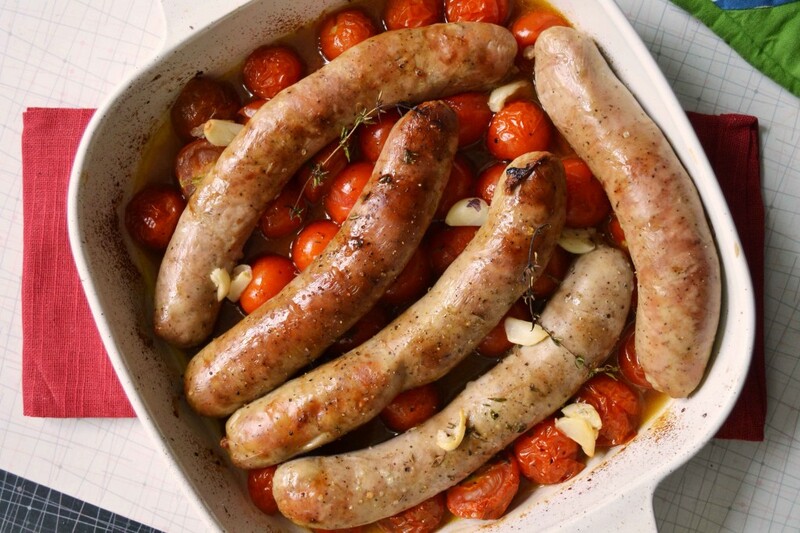 3When the tomatoes have split and the sausages are golden, remove the dish from the oven and stir in the beans. Return to the oven for 20 minutes or so, until the beans are cooked through and the sausages are even more golden. Serve hot, with crusty bread and butter. Kathy – number of servings depends on the sausages you use – ours would have served a family of four or so! My husband’s trainer told him to lower carbs and boost protein. This will be perfect along with a leafy salad. Thanks! I am making this tonight! Pure comfort food. Thanks again, Julie. It’s time to bust out the comfort food, isn’t it? 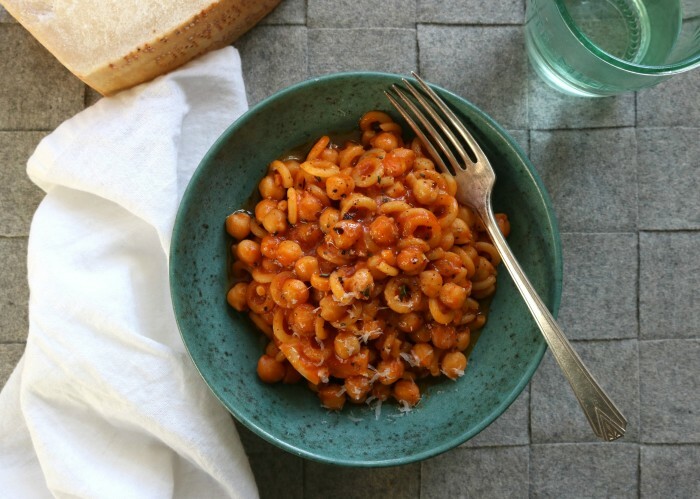 Everything is on hand to make this for dinner tonight – so excited! This looks awesome. With some Spolumbo sausages? Hello! 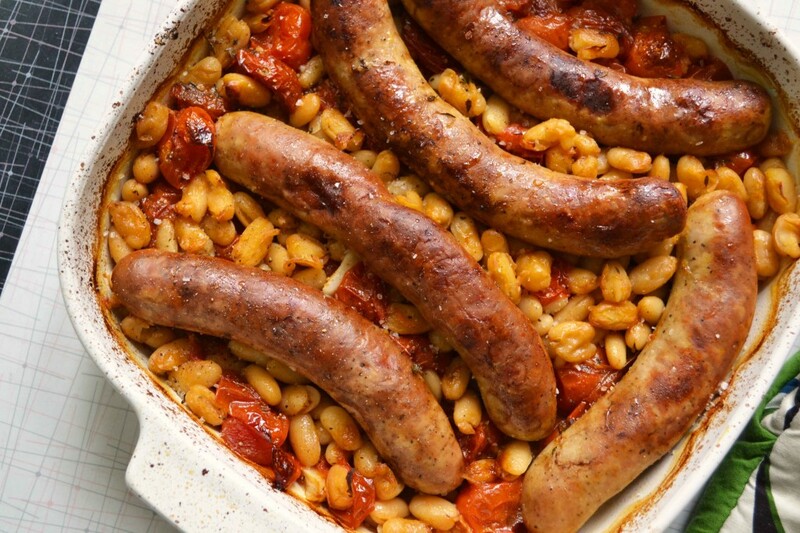 Also love the idea of a quick cassoulet, since I’ve always kind of wanted to make one but it just seems so…long-winded. This is totally happening in my house this week. Yummy!! I really shouldn’t read your blog before I go shopping… I came home with $70 worth of sausage (to be fair, I had a Dealfind coupon). Going to try this later this week with cumberland sausage from Rocky’s Sausage house. suchalab: Check out Pierre’s website (http://kitchenscraps.ca/) he had a bunch of really good refridgerator pickles. I made this for dinner tonight and my husband’s comment was ” You can make this again “. That is as good as 5 stars!!! Delicious! I used Spolumbo’s chicken and roasted red pepper sausage along with 2 mild Italian. I’m sure it would work fine – it may be easier to thaw the sausages first, but they’ll eventually thaw, and then cook, in the oven! I’d try it with chopped whole tomatoes – why not? I made this last night and it was soooooo darn delicious! I added a little of the liquid from the beans and couldn’t have been happier. 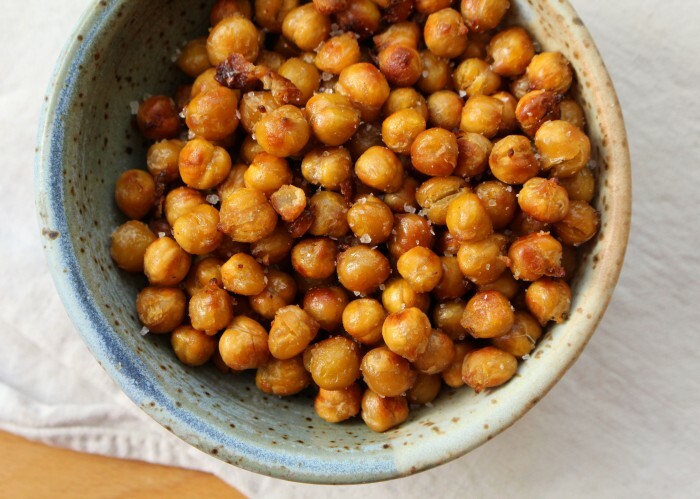 This is my new Autumnal go-to dinner! See? This is why I think you are a genius. You continue to inspire me and make “What’s for Dinner?” an easy question. I made this tonight before hockey and we came home at 6:30 to a delicious feed. Keep the one dish ideas coming – it’s a long hockey season. Well I made this tonight. Mine ended up very soupy, but it was still good. I imagine it was because my tomatoes were larger. Definitely something I’ll make again. made it last night. Easy one dish throw it all together and pop it in the oven, perfect! My husband and I loved this!! It is so easy, and sooo good!! Thank you. Where is Spolumbo sausage sold? I am in the Red Deer area. Neat! I’ve made a similar dish with chicken thighs instead of sausage (http://www.cecinestpasunfoodblog.com/2011/07/chicken-with-white-beans-and-tomatoes.html) Would be fun to try this one! Next time you could also add in swiss chard, kale or spinach for some green. Yum! Saturday night’s supper – you’d have thought I’d been cooking for hours the house smelled so good! It was an absolutely scrumptious meal. A definite keeper and go to this fall/winter. This dish is great! It’s even better than it sounds/looks in the photos. The smell of it cooking in the oven was enough to make my mouth water. I added both fresh thyme and rosemary since I had both on hand, and used spicy sausage. The spice spread throughout the dish as it cooked giving it a wonderful flavour. Thanks so much for sharing this Julie – I am doing to same with my friends! 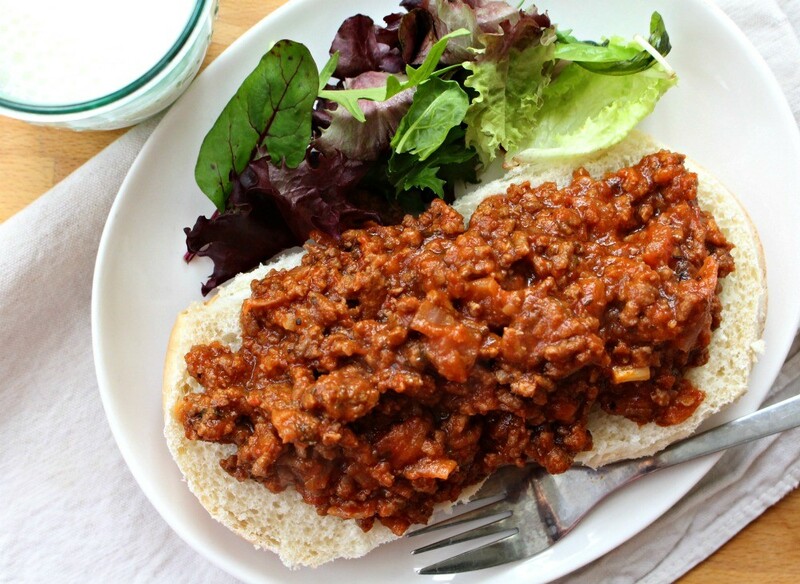 This recipe has become a favourite in our house! 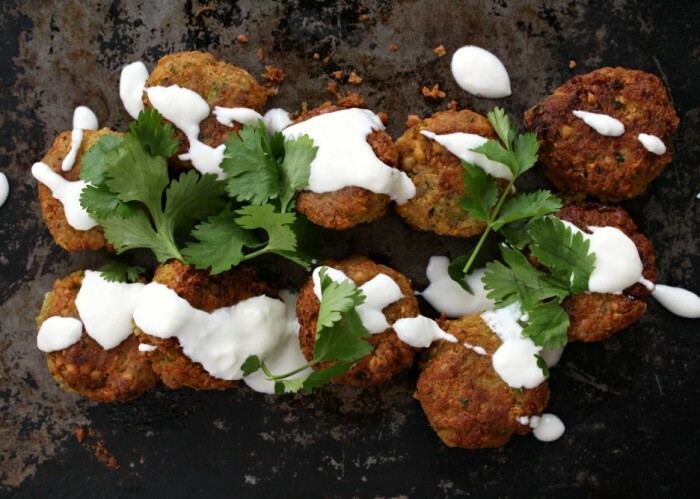 Quick, easy and healthy and it makes great leftovers as well. I just have to comment on this recipe again. I love love LOVE it! It’s one of my favorites, and so easy to make. Sometimes with cherry tomatoes (tonight is a mix of red and yellow ones and one big one), sometimes with bigger ones chopped up. It’s one of the few dishes I’ve shared with people that they all start making over and over themselves. I make this all the time. It’s so easy and so good too! I love it. Oh my God, how can you call that a cassoulet !!!!???? Yes Marco – a true cassoulet is a big production for sure! That’s why this is called a quick cassoulet! This is sooooooo fabulous it will make headlines on my page!!!!! Thank you Julie! How do I follow your blog? Marco: Cassoulet has become synonymous with duck, beans and forty hours of kitchen duty. But cassoulet is any dish that is cooked in a Dutch oven whether it’s duck or not, and whether is cooked for an hour.I have had cassoulet at a friend’s who was a gourmand. and who also spent the entire week cooking this dish. With much ado we all gathered around her table in the middle of a snowstorm… well… let me tell you: with thee exception of the duck, fabada would have been as good. Look up Fabada… you will like it. It is a Spanish dish with white beans as well..
Cassoulet has it’s food roots in the Languedoc region of France, specifically in Carcassonne. As the history goes, this walled city saw many sieges. The fighters on the ramparts had to eat of course. The meal by default was a bean dish with various meats, cooked very early in the day in the baker’s oven, as no one had private stoves or ovens in their homes. Cooking was comunal in nature. 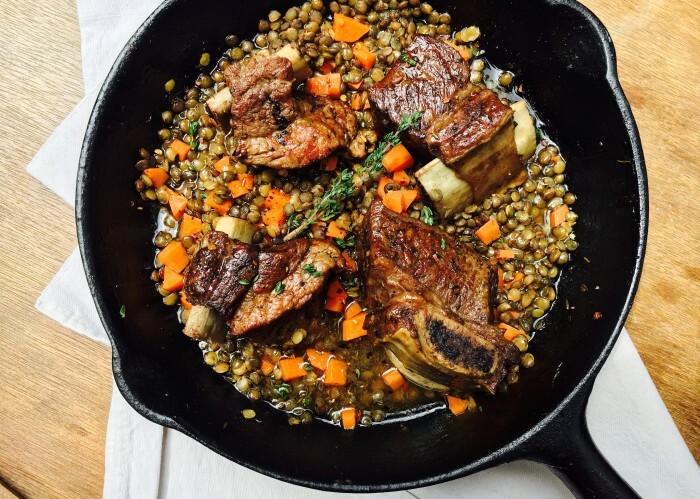 Hence sprang forth cassoulet, just about as popular as the Big Mac in Medieval France. This is an absolutely fantastic meal- so easy to prepare, incredibly delicious, our young children love it (ages 5 and 2). Everyone I have served it to raves about it. It’s nice to cook with beans, which we hardly ever do. Thank you Julie!!! 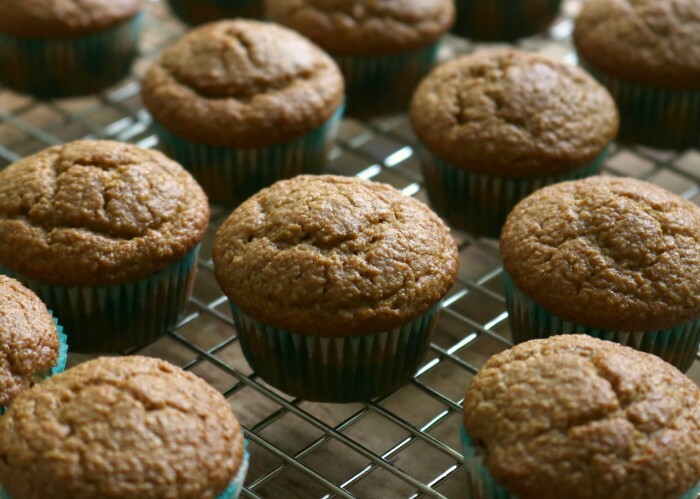 I have made a similar recipe several times and we LOVE this one. I always add a bit of white wine and a slice or two of nitrate free bacon. Gives it a nice smoky flavor. Oh! I forgot to mention we had a family member cook the real French version of Cassoulet and she said it took her days to prepare and cook it. It was amazing but I sure am glad someone came up with a simpler version..hahah! Thank you! 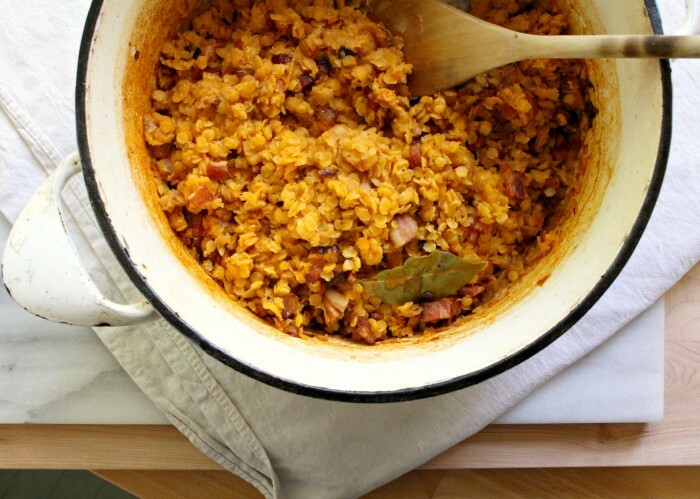 How I love the Quick Cassoulet! This recipe has been on here for seven years! I found it last year, and have made it many times. Making it again tonight. I was thinking of adding to the beans, some fresh spinach and a chopped yellow squash. Was wondering if you or anyone else here has tried any add-ins. Yes! 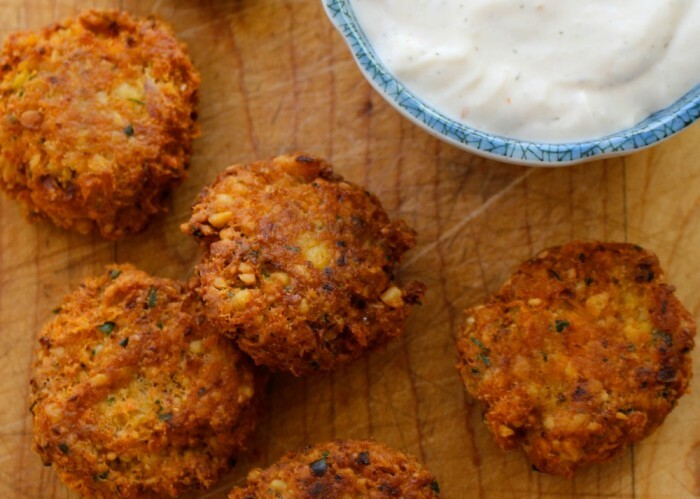 it’s SO versatile… I add all kinds of things to the dish, but kind of love it simple the best!